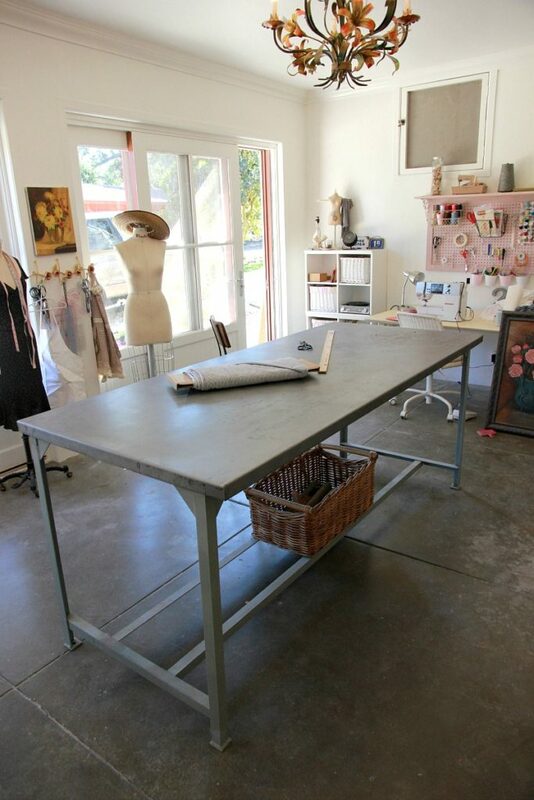 The sewing studio is looking good and almost done! 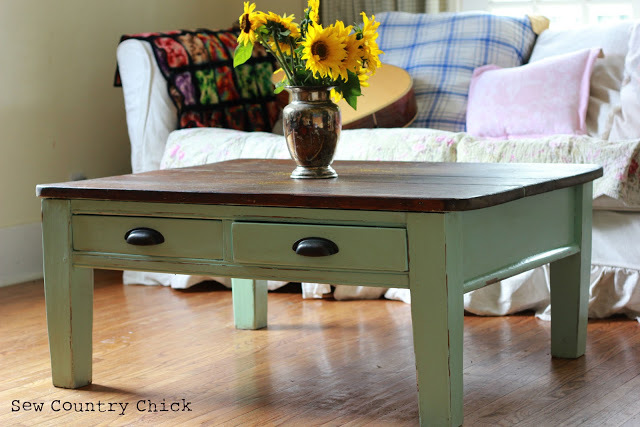 Today I’m sharing how I restored my metal table Richard bought at an estate table. It had a lot of rust on it so there was no way I could cut fabric on it as is. But it was so perfect to use for cutting. Richard also picked up this cool original vintage chair on one of his picks. And lucky for me, he actually let me have it for my room. I’ve been seeing a lot of knock offs of chairs like this recently, but this is the real deal and weighs a lot. Love this chair! Old stuff has so much character. 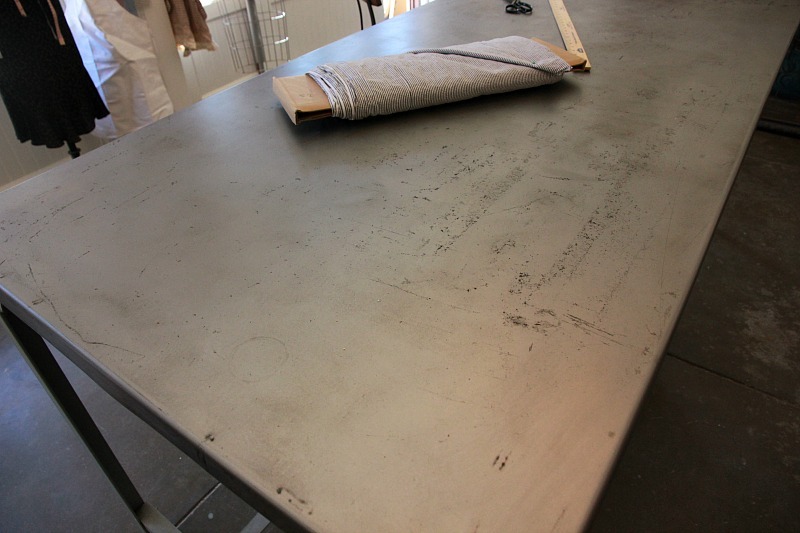 It took some elbow grease to get the table nice and smooth and sealed for cutting out even the finest bridal fabrics. I won’t lie. Here you can see the old paint and rust covering the table. 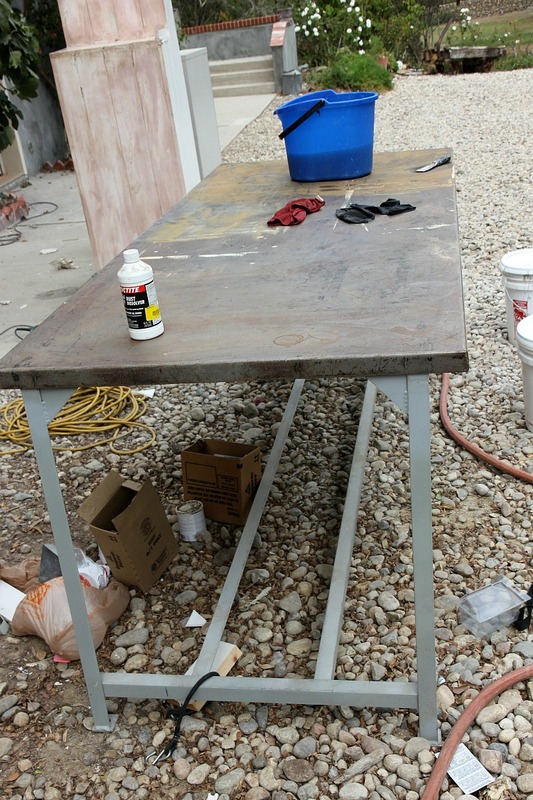 I’m not sure what this table might have been used for, but it’s counter height, so it was some sort of work table. 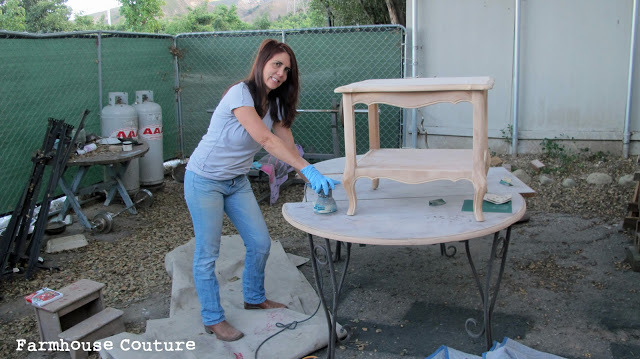 First, I had to sand the top with coarse paper and my electric orbital sander until all the rust marks were gone. Then WD40 was used to clean and shine it. 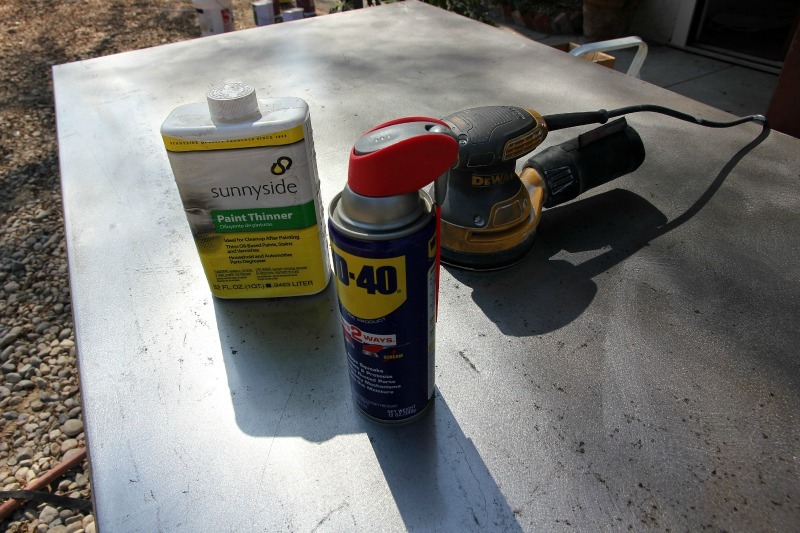 Followed by mineral spirits which were wiped on the table with a rag to remove the residual oil from the WD40. Finally, I sprayed three coats of oil based satin polyurethane sealer on the table to prevent more rust from coming back. And one more project closer to the end! Hope you guys make some awesome stuff for this weekend. I’m living vicariously through you! I have lots of bolts of fabric to fold for my next project. 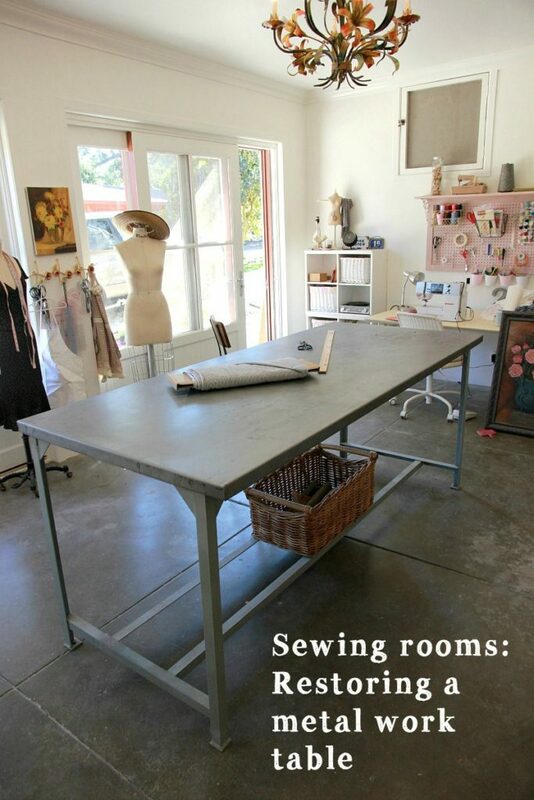 Your sewing room IS looking good. And kudos to Richard for the great find. 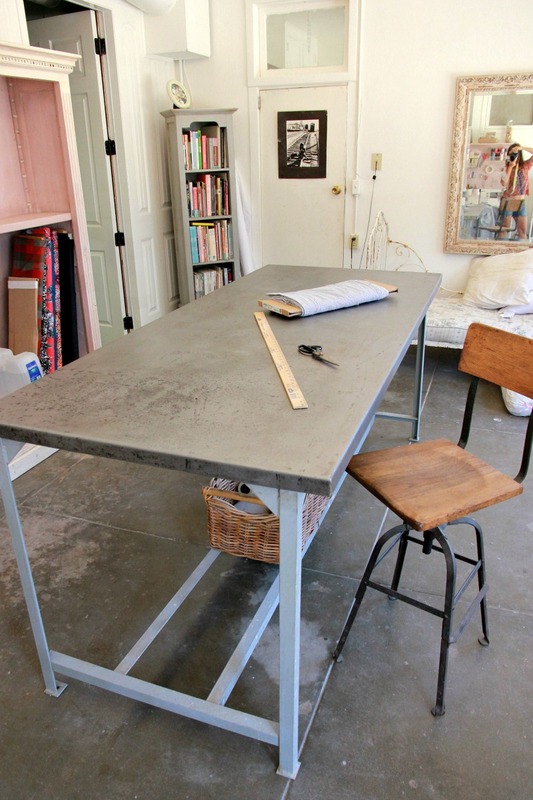 You put in a lot of work on that table, but boy, it sure is a great addition to your sewing room. I especially like how you used the bars below the table for the basket. I still have to use the kitchen table when I want a long space to cut out fabric. Thanks Sandy. I’ve been using a white laminate folding table like the ones at Joann for years. It worked pretty good, but it wasn’t very sturdy. Nothing like having a good sturdy cutting/work table in your sewing room..Mine is an 8′ conference table that dh put risers on.I made a skirt to go around 3 sides so i can store stuff underneath it. Your room is looking great.. Very nice,looking forward to seeing more! thanks so much Justine! I gave away three bags of fabric yesterday and am almost organized! I need to make Gigi’s Halloween costume already! What a great project! I love the whole industial look of your studio with the table and the concrete floor. What a perfect find! I love that it doesn’t look visually heavy and doesn’t stop all that beautiful light from filling the room. Good luck for the home stretch! !